Long time, no see. Massage School Happenings since last we met. Howdy everyone!!! It’s me! Remember? The crazy lady who sold everything, bought an RV and roamed the Country for a bit before landing in Massage Therapy School in Arizona? Well, I’m still alive and kickin’. Hope you are too. Gosh, it’s been a long time since my last post. Almost 2 months by my calculations. I hope all of you have been doing well and are enjoying a lovely summer thus far. Me? I’ve been focused on massage school pretty much exclusively…other than my recent trip up to Alaska, but I’ll save that for next time as I think it deserves its own post. Today, I’ll just fill you guys in on some of the happenings at massage school since last we met….if I can remember back that far that is. Turns out, I had to take a walk down memory lane through the “Pictures” section of my computer to remind myself of some of the above mentioned happenings. So, without further ado, let’s take a look at Adult Education in the world today as seen through the eyes of ASIS. First off we have a photo of our Anatomy & Physiology class learning about the human body at the cellular level. Below you’ll find us studiously learning about cell function, cell membranes to be precise. Here we are demonstrating the fact that the cell membrane is a phospholipid bilayer. Later on, I got to play the part of the Mitochondria, the cell’s powerhouse, which was almost as fun as the time I got to play the TinMan in The Wizard of Oz. Next we have a few shots from one of our Kinesiology classes where we were learning the muscles of the upper leg, which include the adductors, the hamstrings, and the quads. The exercise involved palpating each muscle on your partner and then coloring it in on his or her leg with washable markers. Take a look! And here I am with Mukto. Lord, I’m tall. Sometimes I forget until I see a picture like this. Check out the bipinnate rectus femorus. It’s the one that looks like a feather. And can anyone spot the Pes-Anserine? Ha! I seem to be showing off my new-found knowledge. 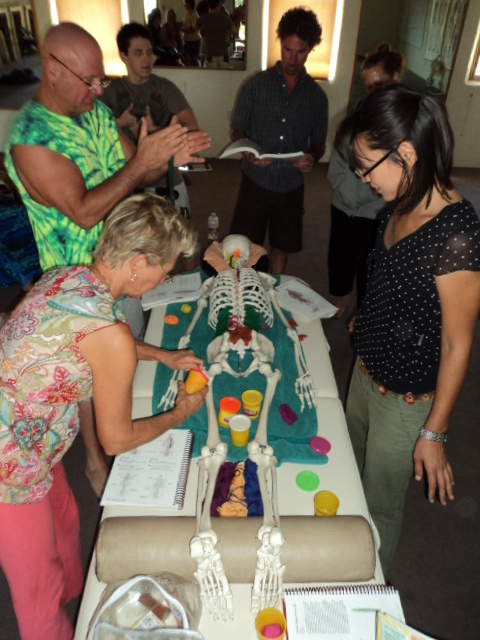 Let’s see, what do we have next…oh yes, another A&P class with the ever knowledgeable and wonderful, Susan who is a Doctor of Naturopathy. How lucky are we to have such a fabulous teacher. Yes ladies and gentlemen, that is a skeleton, Play-Do and yarn. Not only do we get to draw on each other, and act out the function of the cell in a most creative fashion, but we get to play with Play-Do. Can you stand it? I LOVE adult education. In the shot above, you can see we are making muscles out of Play-Do and placing them on Skinny (or Mr. Bones if you prefer) in the proper place and depth paying particular attention to Origin and Insertion points. While the play-do and yarn made this piece of learning fun, this was actually quite challenging so made for a tough class. I think we’d all rather have been receiving a Spa Treatment. Did someone say Spa Treatment? Well. Every so often, the school throws in a Spa Treatment for us to learn. Spa Treatments are certainly not the focus of the school, but are included to round out our education and to accommodate those who may wish to make Spa work their home after graduation. Spa days are a lovely treat since they are basically mindless and feel awfully good. Here I’ve got a few pictures of our Mud Wrap day where we actually made the mud mask to be used. It’s been so long, I can’t recall off the top of my head too many of the multiple ingredients in the mask, but do remember that they were all organic and edible including the clay. This school, is very big on using edible ingredients on the body since the skin absorbs so much of what is put on it. The very few ingredients I remember are: clay, honey, lavender, salt…yup, that’s about all I remember of what must have been over a dozen ingredients. Anyhoo, we partnered up, smothered each other with the mud, wrapped each other up in sheets like a mummy, and allowed the mud to dry. Here’s Mukto giving a treatment to somebody. It’s hard to tell who with all the mud and such, but if I had to guess, I’d say that’s Joan in her towel draping and covered in mud. And here we have the ever smiling Joshua in his towel draping and mud. And here I am wrapped in my mummy sheet and left to dry. I bet this reminds Elo and Heather of that day we spent at the Roman Baths in Baden-Baden. Remember? I do. Remember when we got reprimanded by the German Frau for doing hand stands and playing Marco Polo in the “quiet pool”? Of course Sweet Heather had no part in those shenanigans and was likely mortified by our behaviour….but I digress. What do we have next? Oh yes, fun times in the Verde River. A few of us drove out Sycamore Canyon for a Sunday afternoon of fun and sun at the river. What fun it was to jump into the cool water and float downstream to our hearts content and then swim back up the gentle current to our lounging spot. We took a watermelon, which we chilled in the river while we gave each other salt scrubs (another spa treatment we had learned earlier). I remember having the feeling of my cup running over on this day. What a gift. 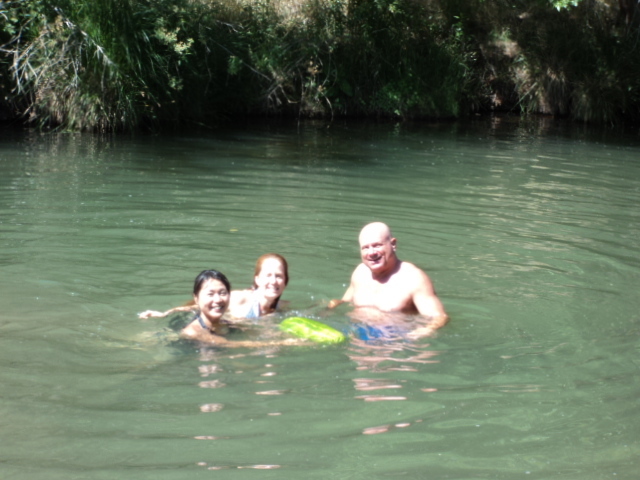 Take a look at Maki, Katie, Michael, and the watermelon floating around in the Verde River. That’s it for school stuff, but I have one more shot for your viewing pleasure. Since I’m not much of a silent sufferer, I bet you’ve heard about my ongoing shoulder issues and that I’ve been receiving regular massage. Well, I got to a place where I felt massage had taken me about as far as it was going to, so I decided to try acupuncture and what better place than Sedona to find a qualified and reputable acupuncturist (perhaps other than China or Chinatown)? Who loves Dr. Robert Abrahamson OMDLA? I do! I do! My search for the above mentioned acupuncturist led me to him and his practice, Sedona Acupuncture. For more information you may click here, http://www.sedona-acupuncture.com/. Robert received his Doctorate in Oriental Medicine in China over 30 years ago (after a stop in London for some of the pre-med stuff and to learn to speak Chinese) and has been practicing ever since. A point of interest is to note that Oriental Medicine was not taught in the United States at the time. Anyway, I could easily devote an entire post to my first visit, but I think I’ll just show the photo at this time. You can see a few of the needles and all the cups. These are Korean suction cups and many of them are covering a needle. 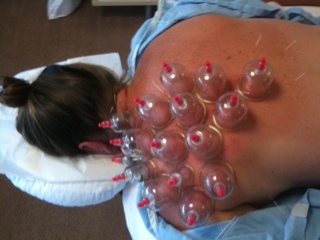 Cupping is often used in conjunction with acupuncture to help release congested Chi and such as that. Acupuncture and Cupping have been used for healing for thousands and thousands of years. You know, we have recently gotten in to the Energy modalities at school like Shiatsu and Polarity Therapy and I find them absolutely fascinating, so it was especially cool to see how what I am learning in school, specifically The 5 Element Theory, is used in real life acupuncture. But that’s a topic for another day and time. That’s it for now. My apologies for taking so very long between posts. Please stay tuned for the upcoming post on my recent trip to Anchorage. 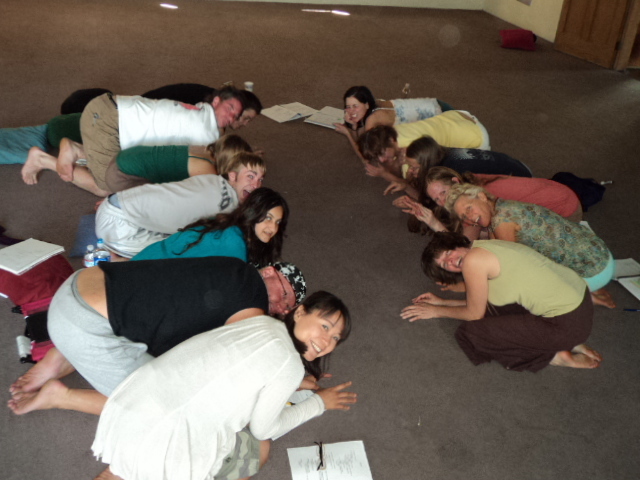 The Massage School happenings are fascinating–can’t wait to see what is next. Good job, Margie! Good to hear from you again and I’m glad you’re cup is running over. Reading your posts brings back old memories. Enjoy your time there! I DO remember Baden Baden!! Remember the repairman just casually walking through the “women’s area” while everyone was stretched out in the buff? A very memorable day all the way around! Sounds like you are having an amazing experience. I am so glad. Keep your posts coming when you have time. Can I color on your leg, play with play doh and mud? You amaze me, Margie! I loved reading about massage school and learning new words – just don’t quiz me! 🙂 The pictures are awesome! Thanks for sharing your adventures with us!